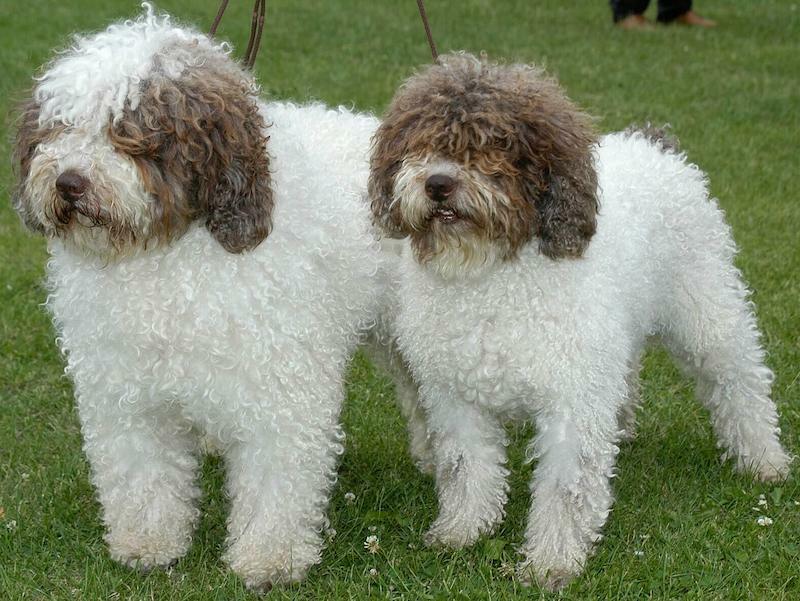 Spanish Water dog is an ancient and rustic all-purpose dog breed found on the Iberian Peninsula. 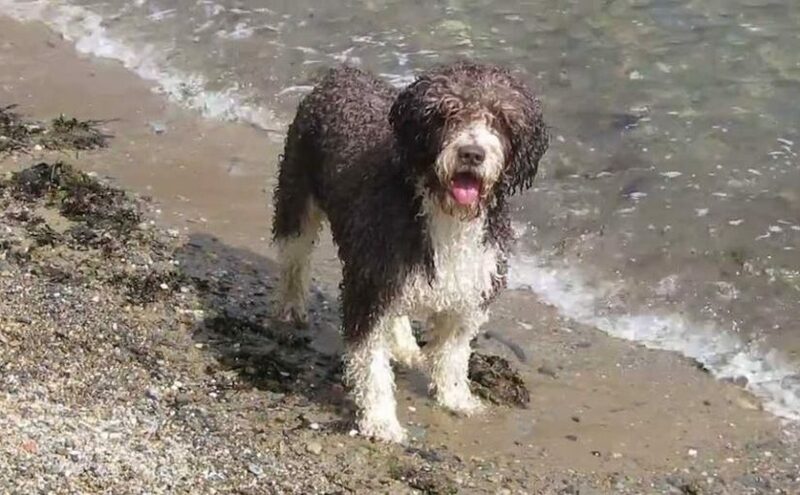 Spanish Water Dog is a herding, hunting and fishing dog with well-developed sense of smell, sight and sound. The Spanish Water Dog has a great learning ability and adaptability to almost all situations. General Appearance: Robust, medium sized dog with well-developed muscle due to regular exercise. Well proportioned (medium weight), dolichocephalic, of rather elongated; the profile is rectilinear; distinctive coat. Temperament Faithful, obedient, gay, hard working, watchful and well balanced. Size: Height at withers: Males: 44 to 50 cm (17 1/2 – 19 1/2 inches) Females: 40 to 46 cm (15 1/2 – 18 inches) 2 cm maximum deviation are admitted in both sexes whenever the subject maintains balance according to his height at withers. Important Proportions: Length of body / size (height at withers) = 9 / 8. – Depth of chest / size (height at withers) = 4 / 8. – Length of muzzle / length of skull = 2 / 3. Coat & Colour: Skin: Supple, fine and well adhering to the body. Can be pigmented brown or black, or be without pigment according to the colour of the coat. The same applies to the mucous membranes. Coat: Distinctive coat which is curly and woolly in texture. Curly when short and may form cords when long. The recommended maximum length of the hair for shows is 12 cm (15 cm extending the curl) and the minimum is 3 cm to see the quality of the curl. The puppies always are born with curly hair. The coat should not be clipped for aesthetic purposes, it should look natural. Colour: Solid: White, black and chestnut in their different shades. ; Bicoloured : White and black or white and brown in their different shades. ; Tricoloured subjects, and black and tan as well as hazelnut and tan dogs are not admitted. Head: Strong, carried with elegance. Skull: Flat with only slightly marked occipital crest. Axes of skull and muzzle parallel. Stop: Facial-cranial depression gentle, only slightly marked. Face: Profile is rectilinear. Nose: Nostrils well defined. Nose is of the same colour or slightly darker than the darkest tone of the coat. Lips: Well fitting; labial corners well defined. Teeth: Well formed, white, with well-developed canines. Eyes: Slightly oblique position, very expressive; of a hazel to chestnut colour, should harmonise with the colour of the coat. The conjunctiva is not apparent. Ears: Set at medium height, triangular and drooping. Forequarters: Strong and vertical. Shoulders: Well muscled and oblique. Upper arms: Sturdy. Elbows: Close to the chest and parallel. Forearms: Straight and sturdy. Carpus(Pastern joint) and pastern: Straight, rather short. Front feet: Rounded, toes tight, nails of varied colours; resistant pads. Body: Robust. Topline: Straight. Withers: Hardly marked. Back: Straight and powerful. Croup: Slightly sloping. Chest: Broad and well let down – ribs well arched; diameter of thorax ample indicating considerable respiratory capacity. Underline: Belly slightly tucked up. Hindquarters: Perfectly vertical with not too pronounced angulations and muscles capable of transmitting to the body a very energetic impulsion and the spring necessary for easy and elegant jumping. Upper thighs: Long and well muscled. Second thighs: Well developed. Hock joint: Well let down. Hock: Short, lean and perpendicular to the ground. Hind feet: As the forefeet. Tail: Docked or undocked. Set at medium height. If docked, docking must be done at the height of the 2nd to 4th caudal vertebra. Certain subjects show a congenital shortened tail (brachyouria). Gait: The preferred gait is a trot. Fault: Any departure from the foregoing points should be considered a fault and the seriousness with which the fault should be regarded should be in exact proportion to its degree. Disqualification: Aggressive or overly shy. ; Inferior or superior prognathism. ; Smooth or wavy coat. ; Albinism. ; Spotty or flecked coat, black and tan or chestnut and tan coat. Any dog clearly showing physical or behavioural abnormalities shall be disqualified.